The Spiderman of Paris: What happened next? Throughout this week, we will be looking back at some of the BBC website's most-read stories of the year and asking: what happened after the news moved on? Late afternoon on Saturday, 26 May. Mamadou Gassama was passing through a neighbourhood in northern Paris, on his way to watch the Champions League final between Liverpool and Real Madrid on television. As he walked along the Rue Marx-Dormoy, he spotted a crowd looking up at a residential building. They were all looking at a small boy dangling from the edge of a fourth-floor balcony, at times by only one hand, while a neighbour tried desperately to reach him over a partition. Gassama would later say he didn't have time to think: he just acted. He reached the lowest balcony, stood on it and leaped up, somehow without falling back, before grabbing hold of the edge of the next balcony up, and repeating it. The crowd below cried "Allez, vas-y, vite!" ("Go, go, fast!") as he made his way up the side of the building, while the boy's grip appeared to start failing. Within only seconds of the start of his journey, Gassama reached the fourth-floor balcony. He then swept the boy up with one hand, bringing him back down on the safe side of the balcony. As he did so, the crowd erupted in cheers, and mobile phone footage showed the traffic had stopped as everybody looked up. Within half a day, that footage was being shared and broadcast around the world. As the film of the amazing rescue spread around the world, so too did the praise for Gassama's bravery. When it emerged that Gassama was an illegal migrant, originally from Mali, French President Emmanuel Macron announced he would be made a naturalised citizen, and gave him a medal for courage. The mayor of Paris did the same, and the city's firefighters went on to offer him an internship, one which he began in early December. His exploits have even been heralded in song, by the singer and comedian Saga Love. In L'araignée Noire (The Black Spider), he sings "He climbed... first floor, second floor, third floor, fourth floor..." all the way up to an imaginary 12th floor. The song also references Lassana Bathily, who in January 2015 hid customers from a gunman who attacked the Paris kosher supermarket where he worked. Like Gassama, Bathily is also from Mali, and was made a French citizen after his brave actions. The two met in the days after Gassama's rescue, and Bathily was able to give him advice as to how to handle the attention. "With the way people look at immigrants these days," Bathily said in an interview in June, "acts like Gassama's can change things. "There were about 1,000 people down there all looking up, doing nothing. He didn't even think about it. His only thought was: 'I have to save that child.' And that's what he did." Gassama has made a few media appearances over the year, and in June he was handed a humanitarian prize at the Black Entertainment Television awards in Los Angeles (among others to be awarded that night were the cast of Black Panther and Beyonce). Naturally shy, Gassama hasn't spoken much publicly since the rescue, and one close friend said he had been a little overawed by the media attention. But the day before starting his part-time role with the Paris firefighters, he gave a rare interview to Le Parisien newspaper, made easier by the French lessons the 22-year-old has been taking over the past few months. "I didn't think about all the floors," he told the newspaper. "I didn't think about the danger." Two weeks after the rescue, Gassama returned to Mali at the president's invitation. In the capital, Bamako, he saw his father for the first time since 2011, when Gassama had migrated to Europe aged 15, travelling across north Africa and the Mediterranean to seek opportunity. The visit to Bamako was the first time Gassama's father had left his home village. Gassama is said to have made good progress in his new job, but it's not clear what will happen when his 10-month contract expires. As his position is only an internship, he will earn only €472 (£426; $534) for 96 hours of work each month. Much of the focus after the rescue was on the family of the boy dangling from the balcony, who had fallen down two floors. 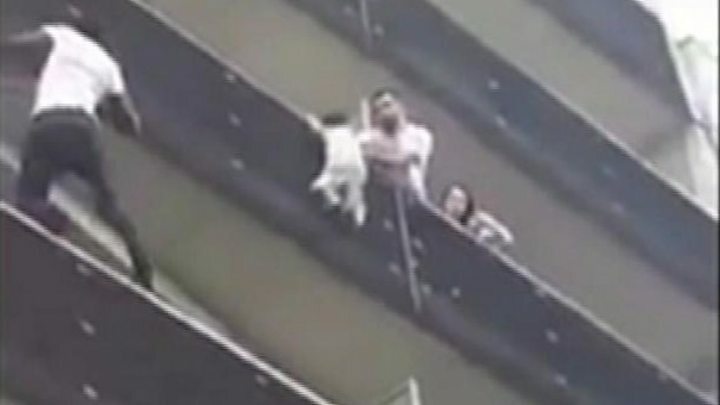 Some people assumed wrongly that the man seen reaching for him from another balcony was his father. It would later emerge that the boy's father was not at home at all, and that he had left his son alone to go shopping. The father delayed his return so he could play Pokemon Go, and the boy's mother was on the French island of Réunion, where the family is from. In September, the boy's father was convicted of neglecting his parental responsibilities and made to take a course in being a better parent. He and the child have never been publicly identified. As for Gassama, he has now moved out of the hostel in Montreuil, eastern Paris, in which he was staying at the time of the rescue. Because he now has all the official paperwork that comes with gaining French citizenship, he has been able to rent an apartment on his own.